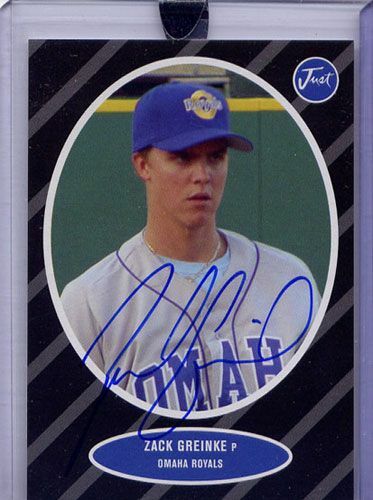 You are bidding on a 2004 ZACH GREINKE Just Black Auto rookie card, numbered to only 25 in the WORLD! This is one of his best cards. The low quantity produced of this card makes it similar to a Bowman Orange/Red Refractor - except for the fact that some of those are un-autographed and STILL sell for $500-$1000! This puppy IS autographed, and there are only 25 of them in existence! This will always be one of, if not his BEST cards. Certified autograph, licensed, and listed in Beckett, much rarer than most brands, and certified with the tamper-proof Just the Proof hologram - this is sure to be one of his more sought-after cards in the hobby. Remember - these are numbered to only 25 in the WORLD! All of our cards are fresh from case breaks, Mint ready to grade. Once again, you are bidding on a 2004 ZACH GREINKE Just certified BLACK AUTO rookie card. GET IT NOW WHILE YOU CAN! Also, be sure to check out our other items - we have TONS of rookie cards listed - base-cards, variations, autographs, limited edition, shortprint autos, rare 1/1's, and also bulk closeouts - and you can find it all listed in our store right now! Please email with any questions before bidding. Thanks for looking and Good Luck!